After releasing Gionee A1 and A1 Lite, the Chinese OEM has yet launched the Pro version called Gionee A1 Plus. This is the bigger version in the A-series of Gionee smartphones. 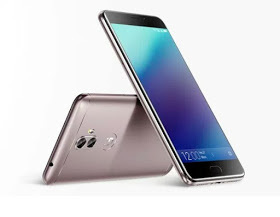 Gionee A1 Plus spots a bigger 6.0 inches Full HD display, 4G LTE enabled, 4GB RAM + 64GB inbuilt storage which can be expanded with an SD Card, dual rear cameras 13MP + 5MP with Led flash and 20MP front facing camera with Led flash. PRICE - Gionee A1 Plus costs roughly 100,000naira in Nigeria ($275 USD). Gionee are really making beast smartphones these days with mouthwatering features. Though the price of these phones might be on the high side but it really worth it. As we all know that Gionee phones are smart, reliable and durable. So it really worth the price. What's your say? This phone is a complete striker. Front cam 20mp? Damn.